Sold in sets of 6 emergency kits. Our emergency comfort kits are great to have on hand when you or a large group are stuck in one place for an extended period of time. Perfect for classrooms, churches, work place or vehicle. These kits will provide light, warmth, food, water and keep you dry in an emergency. 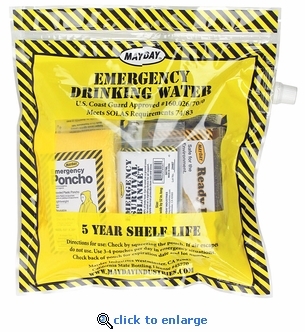 The whole kit is packaged in a 1 liter drinking container that can be used to hold or transport additional emergency water. 1 - 1 liter Drinking Container with Spout. 2 - 4.225 oz. Drinking Water Pouches. Total Weight: 6.94 lbs. Each Kit: 1 lb. 2.5 oz.